Between turning 30 in March, and following the progress that Karen of Chookooloonks is making on her life list, this spring my brain went all kinds of hamster-wheel-y in feeling like I hadn’t done enough with myself to date (untrue) and like there was so much I wanted to do that I didn’t even know where to start (totally true). Putting it down on paper gave me concrete goals, and a place to turn if I was ever feeling bored or unfulfilled or restless. A list gives me a place to start seeking out weekend day trips, to stop doing the same things over and over again and do new things. Or at least do new things in between doing the things I already love. It turns out that I had a hard time making a list. I wanted to put all sorts of epic trips on here, but you have to have some things that are easy to do along with the dreams — a mix of things, all achievable, but some more easily achievable than others. Struggling to verbalize my goals, dreams, and wishes was good for me, though. Items appeared on this list and I hadn’t realized that I had wanted them. The inside of my mind is apparently keeping secrets even from me. The list is broken down, in order, in roughly six groups: sports, photography, food, travel in North Carolina, travel elsewhere, and personal life. So: (more than) 100 things I’d like to do before I die. Go to a minor league all-star game. Go to the Cape Cod League all-star game. Go to the Major League Baseball all-star game. Visit every MLB stadium. In progress! Watch (live) the MLB debut of a player I saw play in college. Visit all ten North Carolina minor league baseball stadiums. In progress! Spend all two weeks in Omaha for the College World Series. Drink a milkshake from Zesto’s while I’m at the CWS. Take a ten day California college baseball tour. Go to Spring Training in Arizona and Florida. Attend a Yomiuri Giants/Hanshin Tigers baseball game in Japan. Go to the Frozen Four. Go to both the men’s and women’s Final Four. Attend every game of an ACC men’s basketball tournament. Attend every game of an ACC baseball tournament. Attend the Iron Bowl (when it’s in Auburn, not Tuscaloosa, because all those ‘Bama fans scare me). Attend a weekend SEC baseball series at LSU’s Alex Box Stadium. Watch every 30 for 30 film. See a game at Allen Fieldhouse in Lawrence, KS. See a Tennessee women’s basketball game at Thompson Boling Arena in Knoxville, TN. Shoot the cover photo for a major music publication. Take photos of every church cemetery in Charleston, South Carolina. Spend an entire national tour on the road with a band. Shoot, show and publish a series of photos of siblings who play in bands together. Take a photo of sunrise at every individually-named beach in North Carolina. In progress! Sell a photo to a minor league baseball team for publicity/press purposes. Become the house photographer for a local venue. Interview ten musicians who are also photographers for the blog. Own a Hasselblad (even if it doesn’t work). Get the Kodak Brownie that Ash gave me for my birthday up and running. Finish developing all the film I shot in 2008. Learn how to develop my own black & white film. Buy a Polaroid, and a Pentax K1000. Shoot a band recording in the Daytrotter studio. 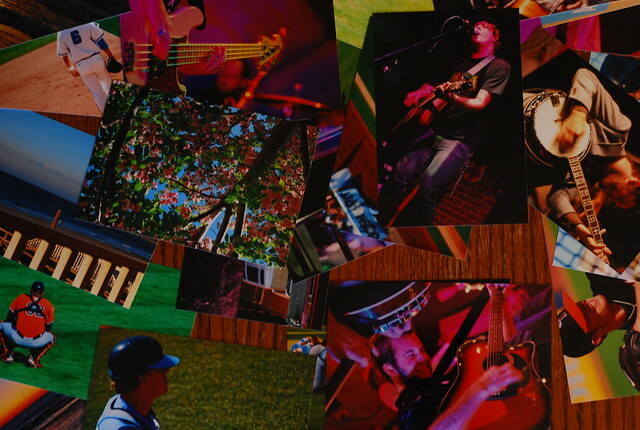 See my photos used as album art and in liner notes for an album. See 100 shows in a year, and shoot them all. See every active band on Bloodshot Records’ roster live. In progress! Take ten great baseball photos with a Holga. Curate a photo project that involves at least ten participants. Take a workshop at Penland School of Crafts. Find and try ten new crock pot soup recipes. Cook a full Thanksgiving dinner for friends and family (including a turkey in the oven). Grow my own grape tomatoes, snap peas, and strawberries. Learn to make paneer and cook an Indian curry from scratch. Go on a tour of five different North Carolina breweries. Find the best bottles of Pinot Grigio and Merlot available for under $10. Make my own dill pickles from local cucumbers. Make ten different varieties of exotic grilled cheese sandwich. Eat at every restaurant in Our State magazine’s 100 Places To Eat In North Carolina’s 100 Counties. In progress! Eat every food on this list. Drive US 17 from the top of North Carolina to the bottom. Visit a North Carolina county fair. Visit Tryon Palace in New Bern, NC and the Biltmore Estate in Asheville, NC. Visit the top ten natural wonders in North Carolina. See a race at the Orange County Speedway. Take advantage of living in a college town and attend a free event at UNC every weekend for a month. Visit the Seagrove Potteries and learn to throw a pot on a wheel. Visit the North Carolina Zoo in Asheboro. Visit one of the North Carolina aquariums. Attend 10 North Carolina festivals. In progress! Attend and shoot ten specialty food festivals, including Bratfest in Madison, WI; the World Championship Barbeque Cookoff Contest in Memphis, TN; the Maine Lobster Festival; and the National Hamburger Festival in Akron, OH. Drive Route 66 and visit Elmer Long’s Bottle Tree Forest. Visit the Desert Botanical Gardens in Phoenix, AZ. Visit the Las Vegas Neon Sign Graveyard in Las Vegas, NV. Drive from Washington to San Diego along the coast, visiting minor league baseball stadiums. Take the Empire Builder from Chicago to Seattle. Go to New Orleans for Mardi Gras (again). Take photos at Artscape and HonFest in Baltimore. In fact, go to Baltimore and act like a tourist for a weekend: see an Orioles game, visit the National Aquarium, the Science Center, and the Visionary Art Museum, eat at Bertha’s Mussels. And also eat everything on this list. Attend the American Sandsculpting & Beach Festival. Attend the Coney Island Mermaid Parade. Attend the Oxford American’s Most Southern Weekend On Earth!. Drink my way across the Kentucky Bourbon Trail. Eat at Costa’s Coffee Shop in Owatonna, Minnesota, with Lirette. See a moose in the wild in Alaska. Pick shells at Sanibel Island. Follow the Bourbon Trail in Kentucky. Visit the Louisville Slugger factory. See every Gilbert & Sullivan operetta performed. Spend a week revisting my old haunts in London. Ride every London Underground line to its terminal stations. Visit Austria and the Czech Republic again. Make a movie about punk music in Budapest with Katie. Spend two weeks in Athens and the Greek Islands. Follow Greece up with two weeks in Italy. Visit South America: Peru, Argentina, Brazil, Chile. Visit Egypt and see the Great Pyramids and the Sphinx. See the Northern Lights while traveling in Scandinavia. Take underwater photos at the Great Barrier Reef. Go on a Lord of the Rings filming locations tour of New Zealand. Stay at Bird Island in Belize. Paint every room in that house a different color. Plant a fruit tree in my backyard. Have an entire week at work where I can answer all my own questions without having to ask someone else for help. Read all of Sir Arthur Conan Doyle’s Sherlock Holmes stories. Finish Thomas Wolfe’s Look Homeward, Angel, once and for all. Keep a house plant alive for five years. Continuously. Learn to change a tire and the oil in my own car. Learn American Sign Language (get work to pay for it). Buy the perfect red and pink lipsticks.